Learn from one of the greatest orchestral trumpet players of today. 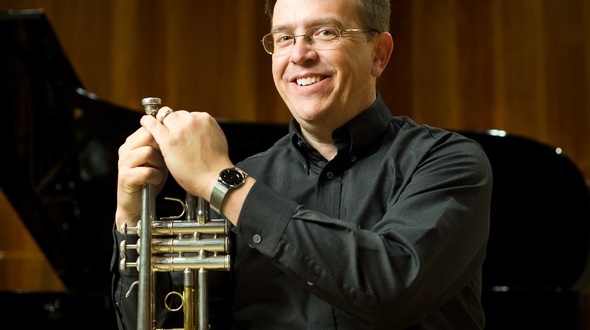 David Bilger has been Principal trumpet at the Philadelphia Orchestra since 1995 and is Professor for trumpet at the Curtis Institute and Temple University. As an acclaimed soloist, Bilger has toured with several major orchestras across the US, as well as performing numerous masterclasses at institutions including the Juilliard School, Manhattan School of Music and Peabody Conservatory. In this extensive trumpet class, one of the US's finest trumpet players shares his ideas and thoughts on how to build a strong fundament for a trumpet player’s technique, sound and agility. From buzzing your mouthpiece, making efficient bends to developing flexibility, your high range and a clear articulation and multi-tonguing – David Bilger explains, demonstrates in details and gives you hands on advice and exercises so that you can start to develop and improve your own playing. This comprehensive class is both Bilger´s Warm up series and his Trumpet Fundamentals, and in this intro Dave presents how he structures his warm up program. Every brass player knows how important buzzing is. Dave shows in details his own buzz routines so that you can imitate and improve. Bending tones on the trumpet helps you develop flexibility, and while warming up this is a bit like stretching out the muscles. You need to get the tongue going during your warm-up routine, and Dave shares his articulation work out program with you in this chapter. Being flexible in your playing is easier said than done. Through warming up you need to get flexible before your daily playing – if you don´t build these routines you will encounter problems sooner or later. Tonguing and double and tripple tonguing is something to be practiced every day. Hear how Dave approaches a daily work-out to get the tongue going. This is a useful tool that Dave shares: a book to keep track of your daily warmup. Intro to the 5 trumpet fundamentals that are needed for anyone who wants to master the trumpet or who just wants to develop their playing. What is a good, rich and full sound that will project and blend? Get to know details about how YOU develop your sound build on some rock solid exercises and principles. If you don´t articulate it´s like mumbling while you talk. That doesn´t work for talking and neither for playing. So you need to understand basics of articulation and how to develop them on your own. The trumpet is or at least can be a very powerful instrument. How to create power without killing yourself? How do you develop that power that is needed being an orchestral musician or playing demanding solo pieces or other repertoire that is tiring? Everyone wants to be able to play those high notes, right? But how do you develop range? In this lesson Dave gives you his expert advice on this topic. You need to be able to play fast at times - and develop agility- moving around smoothly and swiftly is required in many pieces. That´s what this lesson is about. Fantastic masterclass on trumpet playing! Very informative and insightful. One of he best tools in my trumpet life thanks! Very detailed to say the least. He really gets into the basics, and covers every part of playing (sound, articulation, flexibility, range, etc.) that you'd need to work on to step up the level of your playing, and caters to a pretty wide range of skill levels at once. I'd say most helpful parts to me were the material on sound production. You really can't go wrong with this purchase. I still use it almost 2 years later. This fine warm up method by trumpet maestro David Bilger will have you playing with more ease, clarity and focus in no time! Built upon solid fundamentals, David will help you master sound production and fundamental technique. I'm more of a classically trained commercial lead trumpet player including a year on lead trumpet with Buddy Rich and six years on the road as Frank Sinatra's lead trumpet player and since i now am playing more Broadway shows and have a varied stylistic repertoire, David's routine helps me be ready to play anything easier than before with a beautiful. clear and full sound! I highly recommend it to all trumpet players regardless of style! Just hearing his sound and emulating it will do wonders for the beginning, intermediate and even many advanced players! I like what it did for me! One of the most interesting master classes I found on Play With A Pro. A must not only for trumpet players. David Bilger's Play with a Pro video Warm-up Program and Trumpet Fundamentals is superbly done. David's personality quickly puts the viewer at ease. His explanations are clear and thorough, and his is warm-up program and presentation of trumpet fundamentals is logical and effective. Highly recommended! It is sometimes hard or overwhelming to address every area of trumpet playing in one day. Bilger shows and presents a wonderful strategy for addressing every aspect of the trumpet at least some every day, and provides great insight on how to practice and develop technique. David Bilger is one of America's finest trumpet players. His well-articulated and methodical approach to playing the trumpet makes these videos a great resource for teachers and students alike. The quality of the video and audio is incredibly high, and Bilger's information is worth far more than the price of the video. You won't be disappointed! Great Information and instruction for a good practice even if I don't know the expertise of this trumpet player in real concert. A fantastically detailed yet accessible insight into the day to day workings and routines of one of the most respected principal trumpets in the US. I have taken many of the ideas (especially his power routine) into my own playing and have seen great benefits. Bravo! Additionally, I would mind special attention to the video regarding tone. That is essential knowledge that should not be forgone and should be incorporated into any and all practice sessions! Great playing! Excellent master class! This gentleman breaks down each concept into a manner that is easy to understand and follow. He has a great understanding of the instrument and conveys that through his authoritative instruction in trumpet pedagogy. Great job! Additionally, I would mind special attention to the video regarding tone. That is essential knowledge that should not be forgone and should be incorporated into any and all practice sessions! Great playing! It's great to being able to play along such a world class player ! Recommended. It is sometimes hard or overwhelming to address every area of trumpet playing in one day. Bilger shows presents a wonderful strategy for addressing every aspect of the trumpet at least some every day, and provides great insight on how to practice and develop technique. Haydn Trumpet Concerto is one of the most played pieces for trumpet. It´s any trumpet players fingerprint and is pretty much on any audition. David Bilger is Principal trumpet of the Philadelphia Orchestra and professor at Curtis Institute and has taught many students how to practice and improve this tricky piece. Now you can look into his mind and learn yourself from one of the most experienced and talented trumpeters and musicians around. 32 minute masterclass in HD quality, download it to your computer and pass it on to your iOS devices or watch it streamed instantly on any computer, phone or tablet- Android or iOS. David Bilger Online Trumpet Lessons Honegger Trumpet Concerto is one of the most important newer pieces for trumpet. It´s a REAL piece of music, with depth, clarity, lots of technical challenges and in terms of sound and endurance it doesn´t get much harder than this. David Bilger is Principal trumpet of the Philadelphia Orchestra and professor at Curtis Institute and has taught many students how to practice and improve this amazing piece. Now you can look into his mind and learn yourself from one of the most experienced and talented trumpeters and musicians around. 32 minute masterclass in HD quality, download it to your computer and pass it on to your iOS devices or watch it streamed instantly on any computer, phone or tablet- Android or iOS. Hindemith Sonata is another standard trumpet piece and for a good reason. It´s dramatic, it´s history is dark and mysterious, it´s very challenging rhythmically and technically and then it´s after all simply just a great piece of music!! Teacher at Curtis Institute and principal trumpet of the Philadelphia Orchestra for 17 seasons, David Bilger, shares his big experience and knowledge with anyone intersted in developing his/her skills on the horn. Learn, develop and improve your playing. This is a real showpiece. Show what is possible on your trumpet. French charm, finesse and virtuosity are some of the keywords for this fun and tricky piece. Let yourself be guided through all the pit falls by principal trumpet of the Philadelphia Orchestra, David Bilger. Dave also teaches as professor of trumpet at the prestigious Curtis Institute of Music in Philadelphia. Learn, develop and improve your trumpet playing. Yet another virtuose standard piece for trumpet and orchestra, the jazzy and challenging Tomasi Trumpet Concerto. David Bilger has played a lot of jazz and still does so it´s a natural thing for him to talk about this piece when it comes to jazz. And when it comes to understanding this music, he has experience like few others. Dave is one of todays most versatile trumpet players, respected for his divine sound, his ability to make the brass of the Philadelphia Orchestra balance and blend with him floating on top of it all and with that centered and sweet sound, that projects like few. Watch, observe, listen, learn and develop your own playing, guided by David Bilger. One of today's greatest trumpet players gives you the tools needed while preparing for an audition, concert or if you simply just want to improve your trumpet excerpts. David Bilger, principal trumpet of the Philadelphia Orchestra and Professor at The Curtis Institute of Music demonstrates, guides you and shares tips and exercises that will help your own playing. Hailed by the New York Times for his playing of easy brilliance and by the Washington Post for his engaging legato touch, David Bilger has held the position of principal trumpet of The Philadelphia Orchestra since 1995. Prior to joining the Orchestra, he held the same position with the Dallas Symphony. Excerpts come with a PDF with the sheet music ready to print out, so you can follow and play along. Principal trumpet of the Philadelphia Orchestra, David Bilger talks with students about how to practice, advice on auditions, how to develop as a musician, as a trumpet player and much more. Learn from one of the greatest orchestral trumpet players of today – David Bilger is definitely one who has put the bar very high and keeps it up there.